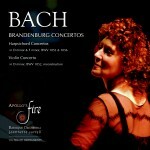 Apollo’s Fire, the Cleveland Baroque Orchestra founded in 1992 by award-winning harpsichordist and conductor Jeannette Sorrell, launched a new association with AVIE with this release of varied works by Mozart, together with an album of the Brandenburgs and other concertos by J S Bach (AV 2207), that exemplify “the intense detailing Sorrell and company bring to music from the Baroque and Classical eras.” (The Cleveland Plain Dealer). These vibrant performances feature popular repertoire brought together in pairings that have not appeared on disc before: the composer’s darkest Symphony, No. 40 in G minor; a dramatic recitative and virtuoso aria from Lucio Silla; Ballet Music from Idomeneo, a festive and rarely-heard suite from the last great work in the opera seria tradition; and four lively and entertaining Contradances. 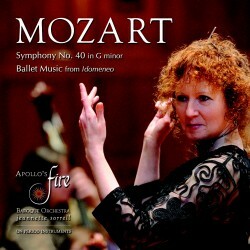 Taking its name from the classical god of music and the sun, Apollo’s Fire is dedicated to the performance of 17th- and 18th-century music on period instruments. Founder and Music Director Jeannette Sorrell and her ensemble of dynamic and creative early-music artists from North America and Europe have been praised internationally for stylistic freshness and buoyancy, animated spontaneity, technical excellence, and creative programming. An award-winning harpsichordist and conductor, Sorrell studied with Gustav Leonhardt in Amsterdam and Leonard Bernstein at Tanglewood.